Summer days call for cold summer drinks. What better way to keep them cool than with a koozie? Last year we made these awesome photo koozies, and this year we’re bringing them back with colorful fabric. 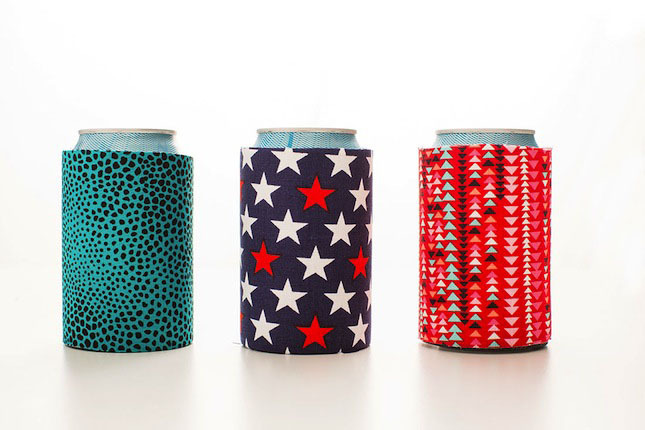 These fresh new koozies will keep your drinks nice and icy. 1. 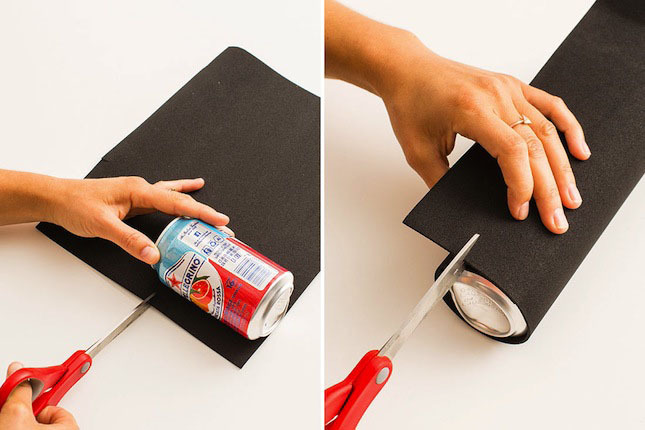 Wrap the foam around a can for size allowing for an inch of overlap. Cut out your foam. 2. Use the piece of foam you just cut out as a measuring tool. Place it on top of the iron-on interfacing, trace and cut. Repeat this step with your fabric. 3. Iron the fabric to the iron-on interfacing making sure the shiny side of the iron-on interfacing faces the backside of the fabric. 4. Add a thin layer of spray adhesive to one side of the foam. Let it set for 3-5 minutes. 5. Wrap the foam around your can with the sticky side out. Then add the fabric to the sticky side of the foam and cut off any excess foam. 6. 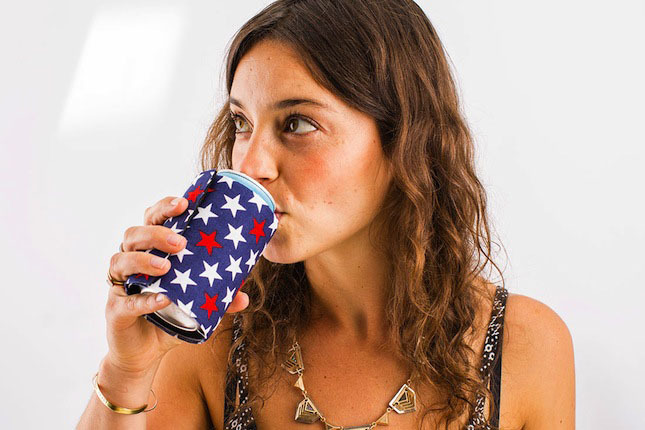 Place two VELCRO® Brand on the end of the koozie. 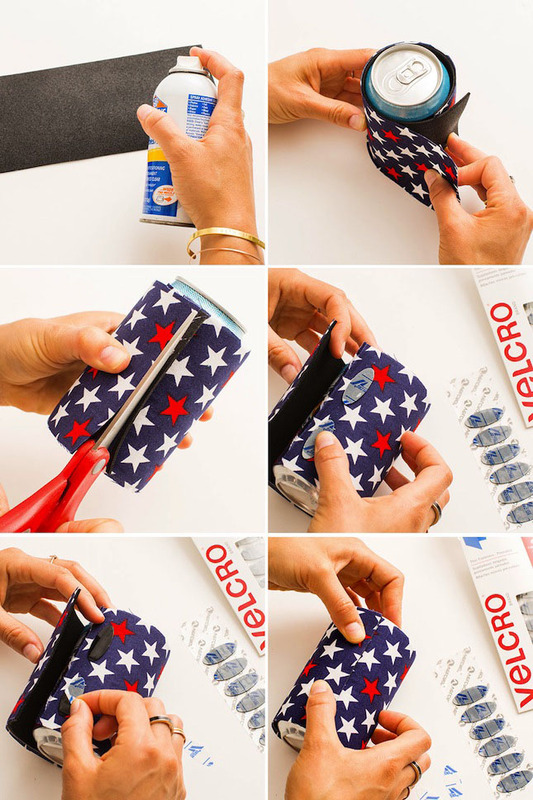 Peel off the backing and then press the other side of the koozie onto the VELCRO® Brand Thin Fasteners. First you’ll need to grab a beverage. Beer, soda, or sparkling water — it’s up to you. You’re going to use your drink as a measuring device. Wrap the foam around your can. You want there to be about an inch of overlap where you’ll add the VELCRO® Brand Thin Fasteners. Cut out your foam and then hang on to it because this is now your new measuring device. 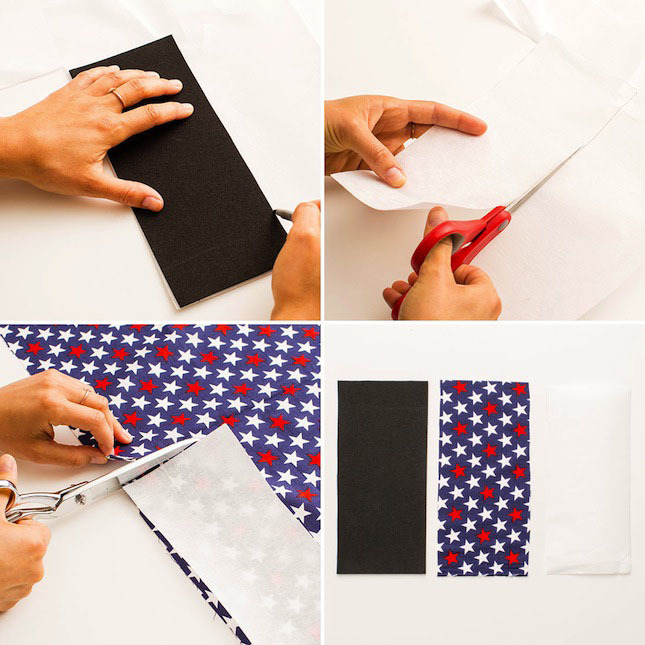 Get out your iron-on interfacing and place the foam on top. Trace around it and then cut it out. Now get your fabric and repeat the same step. You should have three pieces that are the same size. 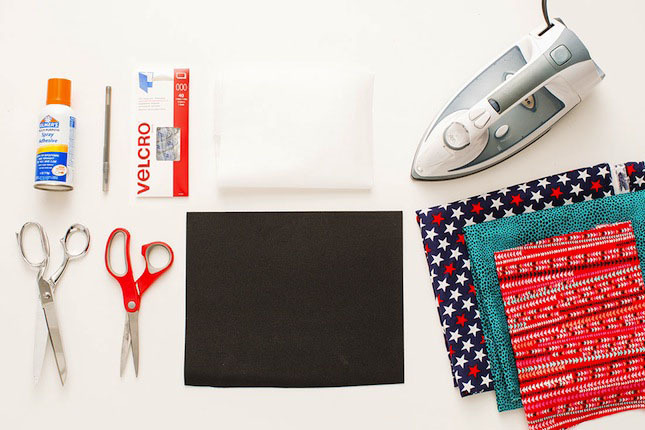 Plug in your iron and then place your iron-on interfacing shiny side down onto the backside of your fabric. Got it? The backside of the fabric and shiny side of the iron-on interfacing should be smooching. 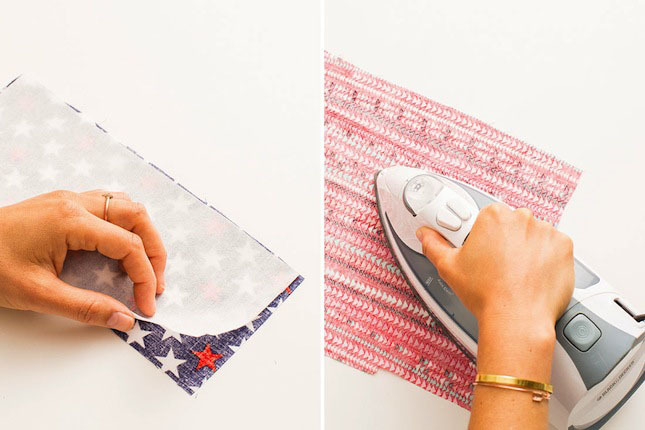 Place an extra piece of fabric on top of the iron-on interfacing and then firmly press the iron down on top. Make sure your fabric and iron-on interfacing have actually fused before you move on. Sometimes it takes an extra round of ironing. Now it’s time to stick these guys together. Head outside and spray a thin layer of spray adhesive onto one side of your foam. You might want to wear a face mask because the spray adhesive is not something you want to huff. Let that set for 3-5 minutes. Wrap the foam around the can sticky side out and then place the fabric on top of the sticky side. The reason we do this around the can instead of flat on the table is that the fabric and foam won’t match up perfectly when they wrap around the can. There will be some excess foam which you can cut off. 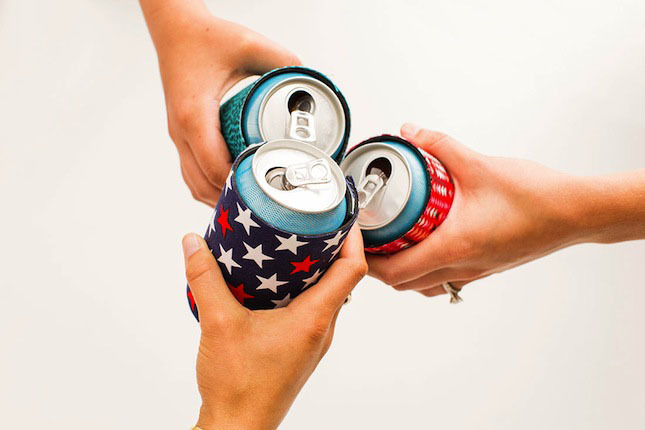 Peel off two VELCRO® Brand Thin Fasteners and add them to one end of your koozie. Take the sticker off the other side of the VELCRO® Brand Thin Fasteners and then press the other end of your koozie down onto the VELCRO® Brand Thin Fasteners. There you have it! These are great for any season or theme. All you need to do is pick the right fabric. We’ve got some red, white and blue stars for Fourth of July, but some red and white stripes would be cute for Christmas and spooky bats great for Halloween. The possibilities are endless!